Michael Ebenezer Kwadjo Omari Owuo Jr., better known by his stage name “Stormzy”, is an English rapper from Thornton Heat. Stormzy has won multiple awards during the short life of his career so far. His most successful song to date is his track ‘Shut Up’ which peaked at number 8 on the UK Singles Chart. As of 2019, Stormzy’s net worth is estimated to be roughly $2 million. Michael Ebenezar Kwadjo Omari Owuo was born in Thornton Heath, London on the 26th of July, 1993. Stormzy attended Harris Academy South Norwood where he pursued his interest in hip-hop. 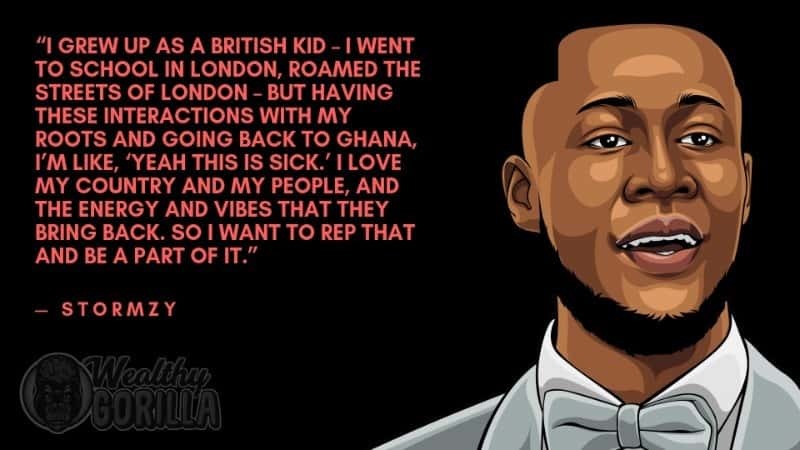 He began rapping when he was 11 years old, and he is of Ghanaian descent. Stormzy began his career by getting attention for his freestyle ‘Wicked Skengman’ in the UK underground music scene. He later went on to release his debut extended play ‘Dreamers Disease’ in 2014. The same year, Stormzy was featured in multiple music videos for various artists including Chip and Shalo’s ‘I’m Fine’ and Professor Green’s ‘Hugs & Kisses’. The following year, Stormzy dropped a single titled ‘Know Me From’ which peaked at number 49 on the UK Singles Chart. The same year, the rapper came out with the final chapter of his freestyle album where the track ‘Shut Up’ charted at 59 on the UK list. Stormzy featured on numerous remixes including Yungen’s ‘Ain’t On Nuttin’, Raleigh Ritchie’s ‘The Greatest’ and Nick Jonas’ ‘Chains’. 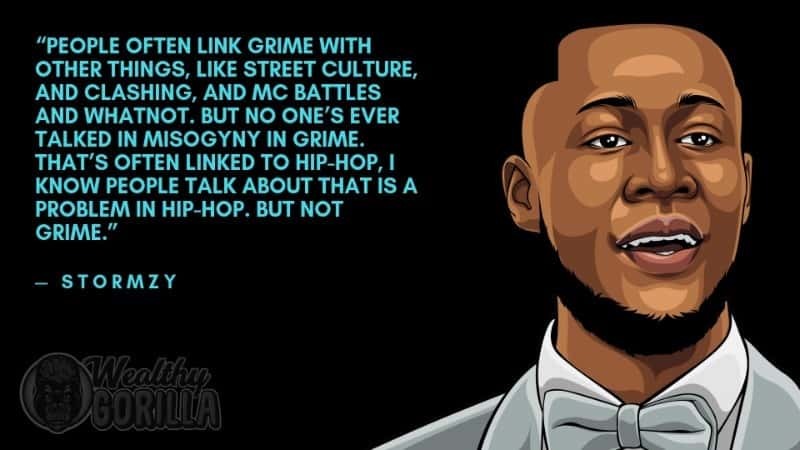 He has also worked with Big Narstie, P Money and Youngs Teflon. In April 2016, Stormzy released the album single ‘Scary’ and the same year he appeared in the remix song ‘Feed ‘Em to the Lions’ alongside Tempa T, Fekky, Rou and Wiley. He later decided to team up with various artists and released a number of tracks as a featured artist. 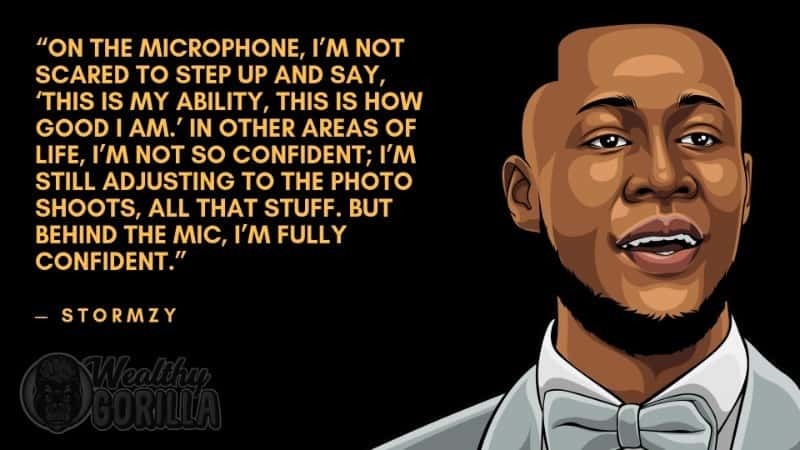 Since then, Stormzy has made a name for himself in the music industry. He recorded the singles Solo45’s ‘5ive’, Little Mix’s ‘Power and Ed Sheeran’s ‘Shape of You’ (Remix). In July 2018, it was reported that he is partnering with Penguin Random House to launch a new imprint named #Merky Books. As of 2019, Stormzy’s net worth is $2 million. View our larger collection of the best Stormzy quotes! Stormzy has definitely taken the world by storm with his fantastic music. However, he has not been on the market for a long time, but we can already see how his music is peaking on the world music list. As of 2019, Stormy’s net worth is approximately $2 million. 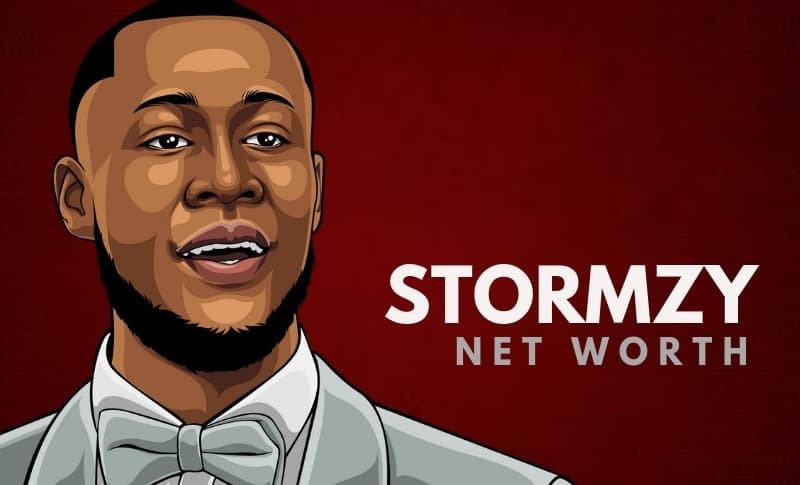 What do you think about Stormzy’s net worth? Leave a comment below.